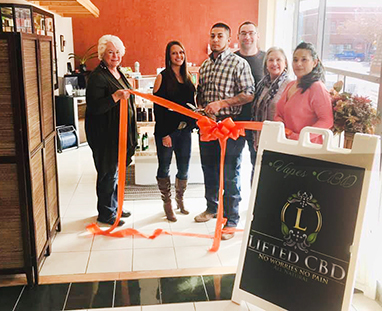 Members of the Artesia Chamber of Commerce and Artesia Trailblazers gather with owners and staff of Lifted CBD during a ceremonial ribbon cutting to celebrate the opening of the business, located in the lobby of Artesia Family Wellness Center, 412 W. Main St. Michael Trujillo and wife Ashley have opened the shop in an effort to help people experiencing pain with all-natural products that won’t harm the liver and do not require a prescription. From oils to capsules to bath bombs, Lifted CBD has products to help relieve pain, stress, anxiety and depression. For more information, contact the shop at 505-545-9273.